Welcome to 5th grade at Wellston Elementary School. My name is Jackie Wall. This will be my 15th year teaching at Wellston Elementary. I have lived in Oklahoma my entire life. 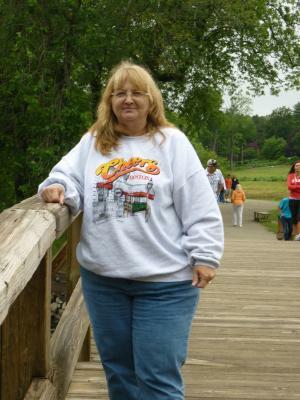 I attended schools in Putnam City, Oklahoma City, and graduated from Jones High School. I graduated from the University of Central Oklahoma with a bachelor's degree in Elementary Education, plus certifications in Social Studies, Science, and Early Childhood. During my first year at Wellston I taught 4th grade. The next year I moved up to 5th and have found my "niche". I love teaching students in the 5th grade and love the curriculum. You might say that I am a history junky. I never liked history when I was in school, but since my first trip to Colonial Williamsburg, I am hooked! I have now been to Colonial Williamsburg 9 times in 15 years, three times taking small groups of students and parents. Last summer (2011) I went to Washington, D.C., Mount Vernon, Colonial Williamsburg, Jamestown, and Boston (another place which has stolen my heart!). This past summer I spent a week at Charlottesville, Virginia, studying Thomas Jefferson. I love learning and cannot seem to get enough. I completed my fourth two-week math workshop on August 3rd.The first one was Project STAT, the second Project Prime,and the third one was Project STEM - science, technology, engineering, and math. This past summer I participated in Project STEM+. It was math, science, and literacy. 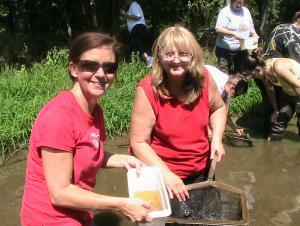 Each of these workshops have also required several Saturdays of follow-up through the school year. Project STEM has introduced me to new technology which I am hoping to pass on to my students this year. I have also participated in a workshop where I built a real working robot. My big project for Project STEM+ is writing a picture book about math or science. My book will be finished by January 2013. It will then be published for our STEM+ group. Our school library will then receive a copy of every book that the participants in STEM+ have written. It has been another very interesting and worthwhile summer! 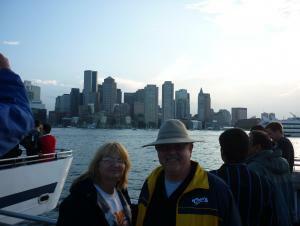 With my husband and the Boston skyline, after an amazing whale watching trip...we saw 7 humpback whales!!! 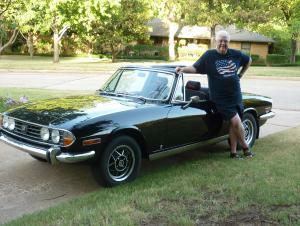 My husband and his "baby", Black Beauty, a 1973 Triumph Stag. 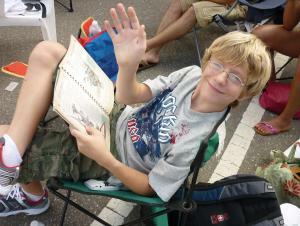 My oldest grandson, Alex, enjoying his book while watching the Edmond 4th of July Parade.Alex is in 9th grade at Santa Fe High School. He plays euphonium (a type of baritone). He is in the men's chorus this year and he is in all AP classes for his core subjects. Jerry III, my middle grandson, is a 6th grader at Summit Middle School. He is very excited about following his in the steps of Papa Jerry, his dad, and his brother by taking trombone in band. 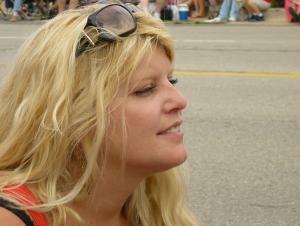 My beautiful, youngest daughter, Sarah. She is an artist. She creates all kids of beautiful art pieces from floral arrangements, to stained glass, sculptures, clothing designs, and photographic images. This is my youngest grandson, Jaden, enjoying his new favorite series of books, Diary of a Wimpy Kid. He is in fourth grade this year. He is going to take violin this year at school. He is also going to try gymnastics for his sports activity. 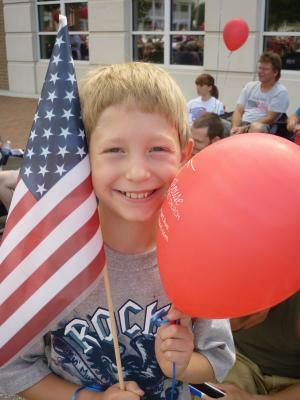 He loves all kinds of sports, basketball, flag football, soccer, t-ball, and even golf.